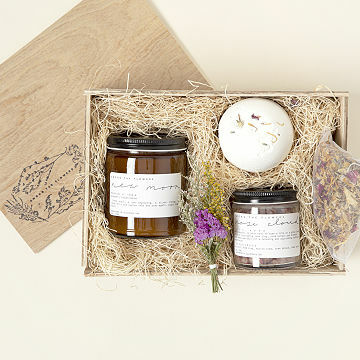 This luxurious kit offers a botanical spa-day experience for your home bath. Short of having your own secluded mountain pool filled with rejuvenating, naturally scented waters, there's nothing like a botanical spa-day experience at home. This calming bath tea soothes sore muscles and encourages relaxation in the warm waters of your bath. Large enough for multiple uses, the moisturizing bath bomb features rich shea butter that melts into your bath with effervescent goodness and detoxifying essential oils. The soy wax candle is clean burning and infused with therapeutic-grade essential oils. Enjoy its aromatic atmosphere while you bathe. The petals and salt of the herbal bath soak will transform your bath water into a pool of detoxifying, mineral-rich relaxation. Presented in a rustic wood box adorned with dried flowers, the collection makes an indulgent gift that will elevate any bathtime ritual. Handmade by Megan Taber in California. This is a gift, so I'm giving 4 stars, only because I cannot rate the actual products, but the presentation of the items is beautiful. I just put a tag and some ribbon on it and it's ready to be given. The smell is great too. Mom said it was very relaxing! This bath box came in a wonderful wooden box and really made its own gift-wrap, so I loved the convenience. The selection of items was also great, and it smelled so nice!! I would buy again, nice packaging. Very nice packaging. Love the smell. My S.O. 's mom recently had knee replacement surgery, so I wanted to get something special for her. It was so beautifully wrapped, and everything smelled delightful. She was couldn't wait to use it throughout her healing process.